What's mud season? It's generally the early spring when our trails here in the Catskills are extra wet. We want you to be able to enjoy our trails any time of the year, but we want to make sure you can enjoy mud season's soggy trails safely and without damaging them or the surrounding environment, so please take a few minutes to learn how you can lessen your impact when hiking during mud season. Now that winter has started to settle into the Catskill Mountains, it's always good to consider the special opportunities and challenges of hiking and recreating in the Winter. 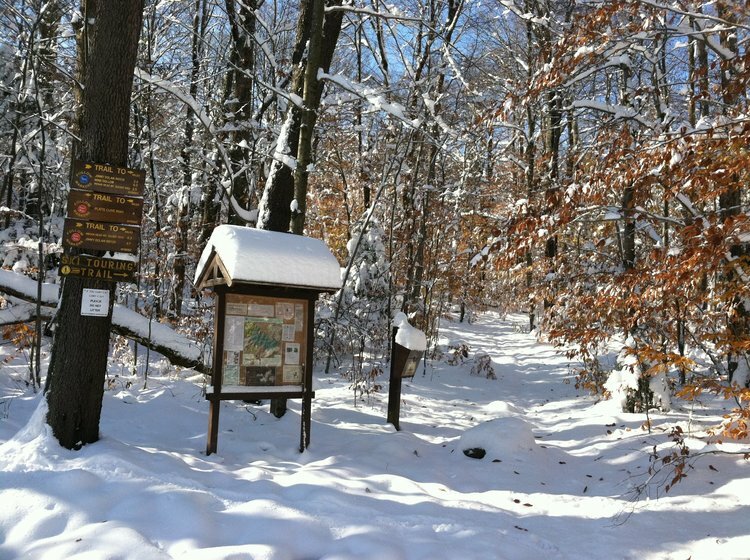 The Catskill Center offers some great winter hiking tips on their website. The New York-New Jersey Trail Conference, together with Unboring Exploring has produced a fun video about how to be properly prepared for winter hikes and activities! Make sure you have a map and guide while you're enjoying the outdoors! The Catskill Mountains Guide & Map, along with many other guidebooks and maps are available in our online shop and at our Gift Shop at the Catskill Interpretive Center!